Despite a strong recovery in US stocks (S&P 500 up 7.87%) and Australian equities up 3.87% (S&P/ASX 200 Index), Australian bonds produced further gains even after a strong performance in December 2018. Although commentators would assume that, with equities up, bonds would sell off in price (higher yields), this did not happen in January. Both the global and domestic narratives have continued to provide a supportive environment for bonds. Looking at the US market, many commentators are expecting two rate hikes by the Fed, a view I supported in my 2019 outlook. However, the Federal Reserve Chairman’s comments have become dovish which have provided support for bond and equity prices. Australia has also developed its own narrative for bond bulls (those expecting lower yields and higher prices) who are firmly in control. December’s lower than expected national accounts (GDP) and public focus on declining house prices mean that only news supporting lower yields seem to be noticed. As I write the January review, it should be noted that the Governor of the RBA stated in a speech that interest rates could go down as well as go up. Bond yields declined by 9bps immediately following his comments. The US 10-year bond ended the month at 2.63%, down from the December month end of 2.68%, resulting in higher prices. There was a similar movement in 2-year US Government Bonds which also fell in yield by 3bps to 2.46% (the fall in yield creates higher prices and positive returns for investors). The 10-year Australian bond finished 8bps lower in yield at 2.24%, with higher prices. The 3-year government bond’s yield also fell (prices higher) by 10bps to 1.75%. Given that the 10-year bond yield fell less than the 3-year bond, the market is talking about Australian bonds experiencing a bull steepening. 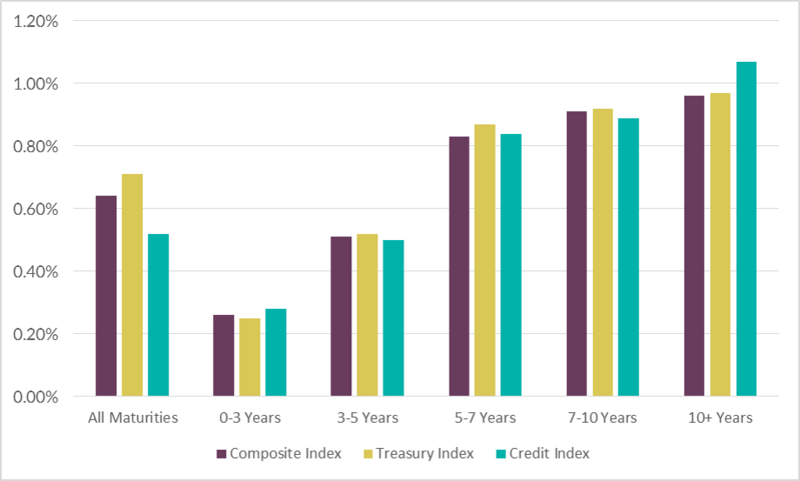 Corporate bonds also benefited from falling government bond yields and corporate credit indices matched government bond indices with similar maturities. The Bloomberg AusBond Composite Index for all maturities (the common benchmark) produced a positive return of 0.64% for the month, reflecting lower yields (higher prices). The best performing sub-indices were the 10+ maturity indices. They have the largest exposure to interest rate risk, due to the long dated securities included in them.